This article is about a car I’ve been waiting to work on. The problem with this particular vehicle is that it came in the shop with a very odd problem, as described by the customer. She would say that her vehicle would just come to a stop and die out after driving it a short while. This seemed very strange, and I’ve never really heard a complaint about a vehicle the way she described. Scanning the car revealed no codes and no problems with any of the electrical components. I drove the car a few miles and did not experience any type of problem like she was having. The service writer even drove the car, but never got it to act up. After talking with the customer again, and telling her we could not get the car to die out, she wanted us to keep trying and figure out exactly what it was. This didn’t seem like it was going to be any fun trying to diagnose this car. When a vehicle isn’t doing what the customer says it’s doing, it’s always a hard fought battle to try and solve the problem. The next day, I decided to take the car on another test drive to see if anything would happen. It was extremely hot outside and just plain uncomfortable, but luckily I think that ended up helping me. I got the car about a mile from the shop and I noticed what seemed to be a dragging sensation. It was like the car was being held back and not going like it should. I turned off the main road and headed down a strip of road that we use for test drives. The problem was getting worse and worse as I drove. I thought to myself that it sure seemed like the brakes were being applied as I was driving. The pedal felt normal at the time, but the car was slowing like the brakes were on. I had a thought that maybe there was some contamination in the brake system that was getting worse as the temp went up from the brakes and hot weather. I popped the hood, removed the brake fluid reservoir cap and low and behold I saw the problem. The rubber gasket in the cap looked an over-inflated version of the regular one. I knew immediately there was contamination of some sort. This explained the slowing down of the car, and although it never died out, I was sure I found the problem. In fact, I barely made it back to the shop because the brakes were actually to the point of locking up as I was pulling in my bay. What was happening is that as I drove the car, and with the hotter weather that day, the contaminated brake fluid was expanding and actually applying the brakes without having a foot on the pedal at all. When another fluid, other than brake fluid, is added to the brake system, the two fluids mix and a detrimental act begins to occur in the system. Anything that has rubber in the brake system, such as the brake hoses, calipers, wheel cylinders, reservoir cap, ABS unit, master cylinder, proportioning valves, etc….all become junk. There is absolutely no way to repair or recover from this without replacing every single component that has rubber in it. The contaminated fluid needs to be flushed out of the steel lines with fresh brake fluid, and then the entire system bled of air. All this is very labor intensive, along with a high expense for all the required parts. This particular car’s repair bill will be a little over $2,000. That’s quite a bit for the mistake of adding some other fluid to the brake system!! So please pay attention to what you add to the brake system. It will only take a small amount of any other like trans fluid, power steering fluid, coolant, and oil to set you on your way of having a large repair bill. Use ONLY approved brake fluid to top off or flush your brake system! 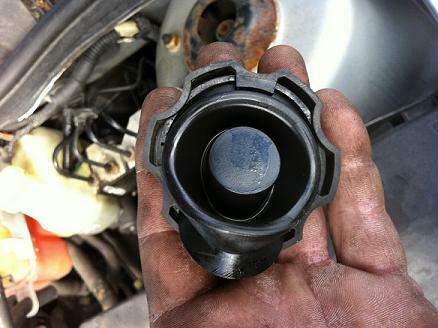 Below are two pictures where you can see how contamination expands the rubber of the brake fluid reservoir cap. Just imagine that happening to every other rubber seal, gasket, o-ring, and more to your entire brake system! The first picture is of the cap from the contaminated system, and the second picture is of a normal cap. You can see the difference!! I have a 2002 Pontiac Sunfire that during braking on ice makes a grinding noise. ProTech: That is probably the anti-lock brakes activating. So that *** awful sound is normal? Yes. You should also feel the vibration in the brake pedal as it is activating. sure do…I also have recently gotten a popping and grinding when I am stopping andd turning the wheel as well as a lurching when I am braking. Hard to diagnose noises over the internet since I can’t hear them, but you might want to get the brakes checked for wear and the suspension and steering components checked as well for the popping noise. Hey I appreciate your help. No problem at all, glad to help! 21 Comments on "Brake Fluid Contamination Causing Problems"
I’ve been having issues with my brakes over the last couple of months & they are slowly getting worse. I’ve only had this car a few months & we have tried numerous things to conclude the issue & today we were going to clean the reservoir out & that’s when we discovered someone had put oil in my brake reservoir… thanks for your article it helps me know what I have to financially look forward too! FYI…. when you buy a car from an individual you might want to check little things like that as well! I had problems with my brakes last week, but this lady’s issue is nothing compared to mine. I never knew that accidentally adding the wrong fluid to your brakes can cause a contamination! This problem does not seem ordinary. Thank you for the post! If my car ever seems like it is braking for no reason I will take it in and tell them to check the fluid. Yes, you can replace the cap, but that will not fix the problem. The rest of the system is still contaminated and will need many parts replaced and the brake fluid flushed. 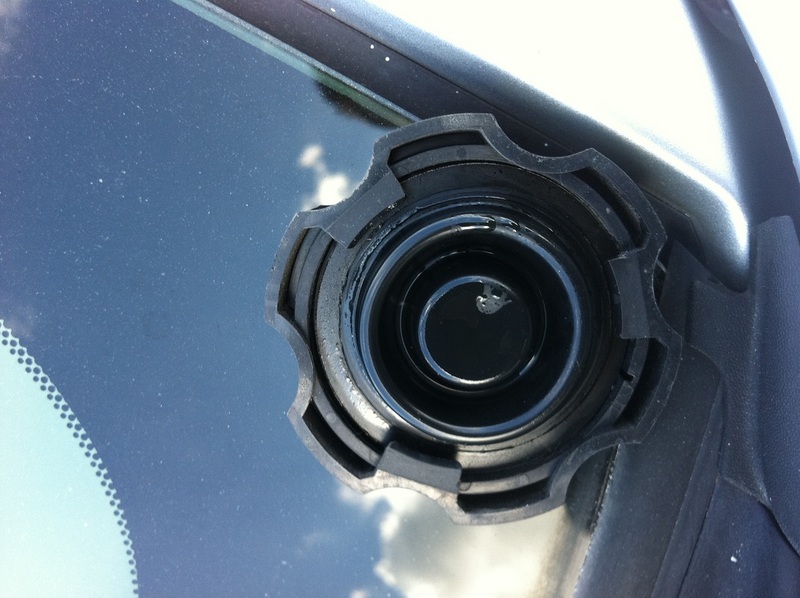 does Insurance cover this issue when Brake Fluid Contamination Causing Problems…can weather cause it?? Some insurance companies will cover this if you prove a shop made the mistake and put in the wrong fluid. The only way weather can cause this is if the cap was left off, it rained like crazy, and the fluid absorbed moisture (which it does). Hi, we had an extensive brake job done on our vehicle in October. We got the oil changed in February. The beginning of March our brakes locked up. We took it back to the people who did the brakes and they said, after looking at the oil maintenance sheet in the glove box, that they must have put the wrong fluid in the brake system. On our oil paperwork they only added windshield wiper fluid. It cost $1869.00 to repair. Do we have any recourse at all, or should we let it go. Any suggestions would be greatly appreciated. We have a 2005 Chevy Uplander. We had an oil change late July. Now we are experiencing the same issues with brakes acting up. Took it to our mechanic he found some bad bearings. We also had rear brakes replaced and still same issues. Our mechanic said it had to do with the ABS and to take it to the dealer where they found the “contamination”. He said we could file a claim with our insurance against the oil change place under “vandalism” on our policy. The dealer wants to charge us $3500 to repair it all. I took the list of parts to our mechanic and he said it’s not necessary to have the BPMV unit (main ABS unit) replaced as there is no rubber in it at all. He’s repaired many vehicles with contaminated brake lines and has never had to replace this unit. Ugh, so frustrated waiting to hear from insurance, which doesn’t look good, our word against the oil change places on how it happened, and we’ll most likely have to pay. So we have the dealer quoting us $3500 and our trusted mechanic telling us no more than $1500. Is this part electro hydraulic or strictly electric? So confused on what to do here. I’ve worked on my other bucks in the past. I’m on a 2004 lesabre tracking down abs/bearing problem. Not sure how to get assembly apart on the rear wheel. Looks like em . Brake has to come apart first? Tom: Yes, take off the brakes, the wheel cylinder, then look through the wheel flange and remove the 4 bolts in the 2 oclock, 4, 7 and 11 oclock position. Then pound off the hub bearing. The brake fluid light has been on in my car for a while a 2006 chevy cobalt. I added fluid and a day later noticed the light was back on. Its been a few weeks and now it seems like my clutch is going. My dad borrowed my car and noticed the brake fluid light added fluid and said it leaked out. You must have a leak somewhere. The clutch problem would not be related because it has it’s own master cylinder that is separate from the brake master cylinder. It’s pretty dangerous driving around with a brake fluid leak, so you will want to get that checked out as soon as possible and fixed!! So we have a Chevy Uplander that we took into the dealership four months ago to have our brake pads replaced and our fluids changed flushed, and or topped off. Now our brakes have totally failed and we brought it back to the same dealership and they told us that the brake fluid had little bits of rubber in it that got throughout the system. They didn’t even bother telling me the fluid was contaminated! I have not touched the brake fluid at all. They have been the only ones to ever change it. They say it is going to be a 2900.00 bill and my extended warranty will not cover it. Am I missing something? Can your brake fluid just become contaminated and have the rubber swell like that in four months since they just checked out everything? No, the fluid cannot just become contaminated on it’s own. Someone put the wrong fluid in it. As you say that Dealer is the only one that does ANY work on your Chevy Uplander, then they made the mistake and should repair it at no cost to you. So I have a 2006 Pontiac G6. The brakes completely froze up while I was driving the vehicle. I took it to my mechanic he said it had to be the calipers. I replaced all four of those and the brake pads (that were not bad) and couldn’t get two of the four brakes to bleed. I took it back to him they tried to no avail. I took the car to Midas where I was told the brake fluid had been contaminated. Midas is not equipped to work on contaminated cars so they recommended I take it to a dealership. I did that and they said I could possible turn it into my insurance under comp. I did that and they are fighting me all the way. They said they found contamination in the reservoir and the master cylinder and they will pay for that but when they took the ABS module apart they found a mechanical malfunction so they will not pay for that. I was told even with the slightest contamination all the parts need to be replaced. How is it even possible for two parts to be contaminated and not the others? Please help. We have been going back and forth for 3 weeks now. Yes, with any contamination, all parts that have any rubber in them need to be replaced. This includes the ABS since there are rubber seals inside. I dont know how they can take the ABS module apart and look at it to decide something is wrong with it. If there is physical damage, then i would guess it is from the contamination. How long would the brake fluid have been contaminated before this would happen your car please.The same thing happened my car power steering fluid instead of brake fluid,trying to trace when it happened. It usually takes a few weeks for the problems to show up. But that depends on much of the wrong fluid was put in the brake system. The more there is, the quicker the problems will show. Years ago I had a similar problem. The front brakes started dragging on my Ford truck. Some weeks before the check valve on the booster had fallen apart so thinking it wasn’t very important I just taped it up without the guts. So when the engine was shut down the vacuum in the booster would draw fuel mixture in from the manifold. The first thing to be effected was the rubber disc behind the pushrod for the master cylinder. It expanded and didn’t allow the pistons to retract enough to clear the hole and release the pressure to the brakes. Changing the booster and valve/fitting solved the problem.